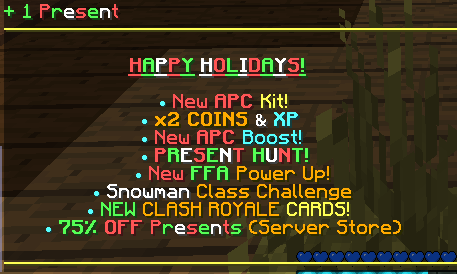 AVALANCHE FFA Power Up will be making its way in the Xmas update! SOON, maybe over the weekend, maybe when he makes up his mind, who knows, stay tuned!! 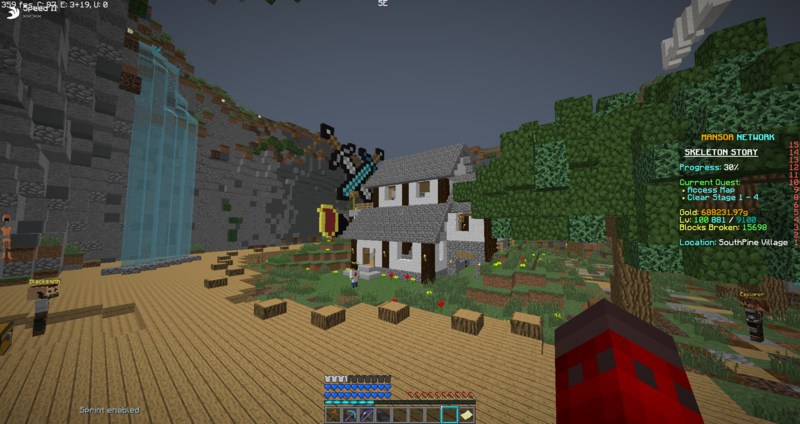 A sole survivor during "Lord's" attack lead by Herobrine. Now you seek to go on a journey to avenge your fallen ones. At some point Team Objectives and Storymode were removed, idk why dont ask. I'm assuming its cause it's not played enough!!! Spent most of my time debating whether to go on the server, was afraid I was banned or something like that, can't imagine why, I have a novel of the "why's" and "wtf r u thinkings". Waiting to see the new staff members!!! I'm sooo gonna bug annoy them!!! If anyone can give me pointers on advertising just msg me, I'm clueless on what I'm doing XD, and no not a "just don't", or "quit, stop your horrible at it" looking for legit advice or feedback!! 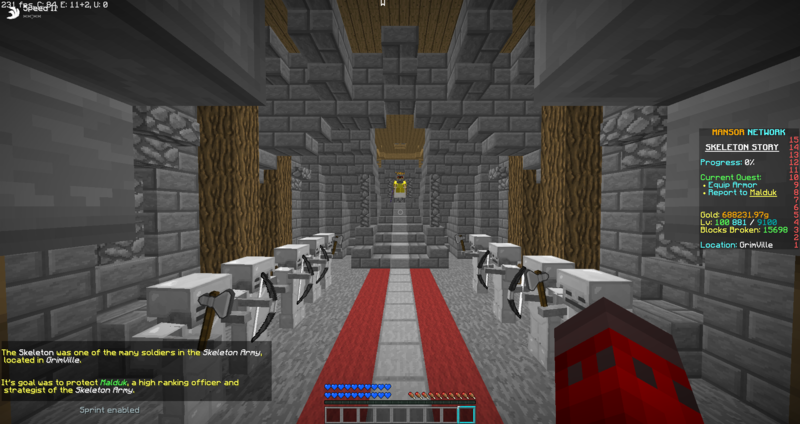 I have no freaking clue to what I'm doing anymore just join the server, it's awesome, bring friends, or you can play solo(APC and Clash Royale) I was on an unanamed server and I had to wait 20 MINUTES before a game started. THAT WILL NOT HAPPEN ON MANSOR NETWORK!!!! Cast powerful personal barriers that convert incoming damage into energy. Aggronaut is an invaluable asset on the front lines of any battle. 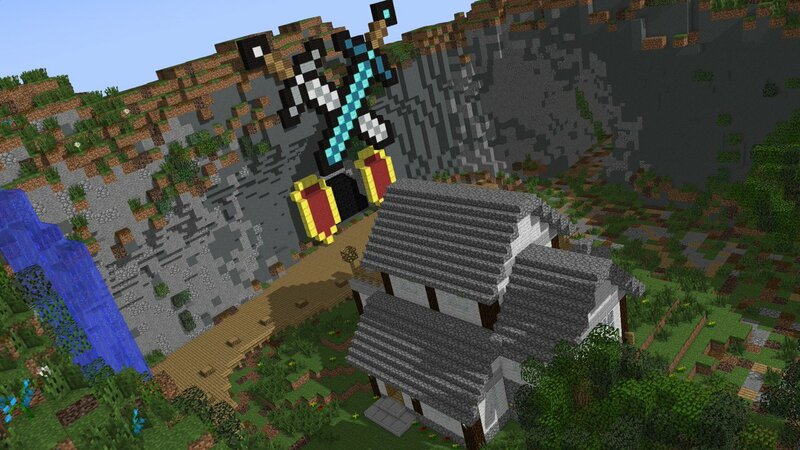 Will be coming in the 'REWORKED APOCALYPSE' update! Yomogi posted a video! Very happy!! Called it 👑"CRAFTROYALE"👑 PERFECT!! Geeze, Mansor brought 💎Overwatch💎 to Minecraft, now he brings 👑Clash Royale👑 to MC, what is next?????? ?